In the first week of May (2nd to 6th) the EcosimPro team will be at the biannual Space Propulsion Conference organized by ESA and 3AF in Rome. We will have a stand where we will be showing the new features of EcosimPro and of the space propulsion simulation toolkits. ESA and Empresarios Agrupados have organized a workshop for users of EcosimPro/ESPSS on Thursday 5th May at 14:00. There will also be two conference sessions dedicated to EcosimPro/ESPSS papers on Thursday 5th May (Sessions 69 and 77) and on Friday 6th May (Session 93). Empresarios Agrupados will present the paper entitled ESPSS Model of a Simplified Combined-Cycle Engine for Supersonic Cruise in Session 93. If you would like to arrange a meeting with us, please contact us (e-mail: jvv@empre.es). Hydrogen is an expensive utility used in several processes in oil refineries, mainly in desulphurization and hydrocracking plants, and which is gaining increasing importance in the global refinery economic balance. 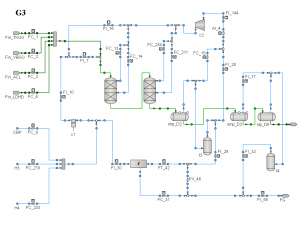 Within the framework of a project aimed at the optimal operation in real-time of the Petronor refinery H2 network, an EcosimPro library H2NET has been developed. The H2NET library comprises first-principles models of the main equipments and operations involved in the network management: gas streams, reactors, high-pressure separators, low-pressure separation processes, tanks, membranes, compressors, meters, valves, and mixers and splitters supporting also pipes with unknown direction for flow. The network model built with the H2NET library has been used for different purposes. For What-If analysis in simulation; in a cooperative project with the Repsol Technology Center in Móstoles (Madrid) aiming at the revamping of the Petronor H2 network, where new connections and alternatives were considered and assessed; as case study for the formulation of real-time resource efficiency indicators REIs in the European project MORE; as well as for the network optimal operation in real-time. Regarding this last target of on-line decision support, firstly a data reconciliation problem is solved by optimization techniques, formulated as the minimization of the measurement-model deviations taking advantage of all the redundant flowmeters available; model parameters are calibrated at this stage and measured and unknown variables estimated. 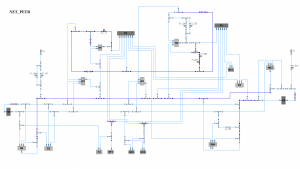 The optimal operation has been addressed with a real-time optimization RTO approach as the minimization of the H2 production cost based on the network model once calibrated in the data reconciliation stage, and including all process constraints and specifications. Reasonable results, ready to be implemented as decision-support for the operation, has been achieved and analysed regarding the production rates in producer plants, the make-up flow rates to consumer plants from the different headers, as well as the high-pressure purges and membranes flow rates. Snopt, based on a SQP algorithm, is used as NLP solver for both optimization problems. The H2NET library includes several additional features: i) configuration structure to enable an easy link with the SCADA for process data acquisition; ii) functions to perform the corresponding data treatment and initialization of variables; iii) functions for the automatic generation of the code needed to implement both optimization problems; iv) management of the linear constraints to conveniently bound the search region in both optimization problems, exploiting model structure. Financial support from the MICINN and the cooperation and involment of the Petronor-Repsol group are gratefully acknowledged. * New features in forthcoming version of the program: simulation from schematics, and capability to export workspaces. 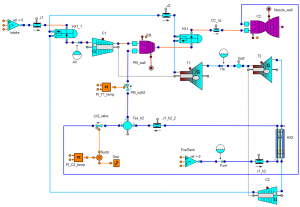 * Hardware in the loop (HIL) applications with EcosimPro models. * Information about new versions of the following toolkits: ESPSS, CRYOLIB, THERMAL_BALANCE, and FLUIDAPRO. * Future platform for satellite simulation. * Thermosolar library in PROOSIS. * PROOSIS course in the ISAE, Toulouse. * EcosimPro course in ESA-ESTEC. * ASME SAE gas turbine standardisation commitee. * Symposium on Space Flight Dynamics (ISSFD). * Simulation of advanced thermo-solar systems. * Space Propulsion Congress 2016. * EcosimPro library for modelling, data reconciliation and optimal operation of hydrogen networks. As in previous years, the EcosimPro–ESPSS team will be at the upcoming Space Propulsion Congress this May in Rome. On this occasion we will present several papers based on the ESPSS simulation library improvement works carried out in the Multiphase Flow Modeling project, in which some of the most renowned European space propulsion companies and institutions participated. Implementation of the AUSM numerical method in order to attain greater precision in the results of the models, by reducing the simulation time in comparison to other similar applications, by the Universidad “La Sapienza” de Roma. Development of a non-homogenous two-phase flow model in ESPSS, based on the AUSM numerical method, by the Von Karman Institute. Development of a code for calculating the evolution of the complex geometries of the fuel in solid-fuel rocket engines, by ONERA. Improvements in the simulation of the dynamics of a spacecraft and its coupling to the propulsion system, by KopooS. The ESPSS team will present an additional paper entitled “ESPSS Model of a Simplified Combined-Cycle Engine for Supersonic Cruise”, showing the capabilities of the libraries for simulating a high speed engine. The model combines an atmospheric engine with a liquid fuel rocket engine, also including a closed helium cycle with a system of heat exchangers to increase its efficiency. In addition, the team will have a stand to present live demonstrations of EcosimPro and will organize a workshop where users can present their models and requirements, and the developers can present their latest additions to the libraries. 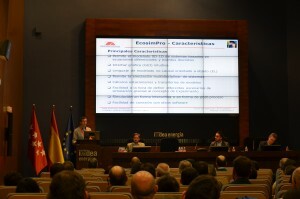 On 23rd October 2015, EA participated in a conference called “Analytical Tools and Experiences in the Production of Advanced Thermo-Solar Systems in IMDEA” organized by Instituto Imdea Energía, in the framework of the European projects STAGE-STE and ALCCONES, included in the R+D Activities Program of the Madrid Regional Government. The conference focused on the presentation of simulation tools and experiences applicable to new formats and concepts of thermo-solar power plants. The conference was very successful both in research centers and companies involved in that sector. The presentation was well received by the audience due to the flexibility and multi-disciplinary character of EcosimPro. EcosimPro attended the 25th International Symposium on Space Flight Dynamics held in Munich from 19th – 23th October. The symposium brought together the foremost international experts in space flight mechanics from the main agencies and space research centres, such as NASA, JPL, ESA, JAXA, Johns Hopkins University, DLR, etc. Over these four days, participants shared their experiences in the operation of space probes and satellites, mission analysis, space debris mitigation techniques, etc, as well as their associated mathematical challenges and the methods and tools used for their resolution. The EcosimPro team, in collaboration with the Space Dynamics Group (SDG) of the Universidad Politécnica de Madrid, took part in the symposium presenting a poster based on the “Novel dynamical model for an object-oriented space tether simulator” article that can be found on our web page. We also presented a new set of libraries for the simulation of Space Tether Systems (several satellites joined by cables) and for common space mechanics applications, such as orbit and dynamic propagation, attitude control, formation flying, etc. EA participated in the ASME SAE S-15 Standardisation Committee on “Gas Turbine Performance Simulation Nomenclature and Interfaces” in Cleveland, USA, between 20th and 21st October 2015. Representatives from some of the most important aeronautical R&D companies and centres (General Electric, NASA, Lockeed Martin, Pratt Witney, Rolls Royce, MTU, NLR, etc) were in attendance. ARP 5571 and AS755 on the standardisation of the identification of variables, stations and objects. The reference documents of all the standards were discussed over the two days, and new modifications were agreed on for some of them. The latest additions to NPSS and GSP simulation tools were also presented, both are motor performance simulators that are similar to PROOSIS. NPSS has been developed by a consortium of companies led by NASA ad under the execution of the Southwestern Research Institute (SWRI), and GSP is a program developed by NLR (Netherlands). These meetings were fruitful for all attendees of the aeronautical engine industry because they served to exchange points of view on different aspects of these programs. They will certainly be taken into account in the new versions of our PROOSIS product. Furthermore, participation in the development committees of the standards will allow us to keep to date on their evolution and facilitate their incorporation into PROOSIS. It will also allow EA to suggest improvements to future versions of the standards based on our experience with PROOSIS users. Last December a general course on EcosimPro was given in ESTEC, the main technological center of the European Space Agency (ESA). It was attended by engineers of the Power Systems Department, responsible for the generation, storage, conditioning and distribution of power for ESA space missions. EcosimPro has been used for several years in Power Systems to verify the design of the batteries of the satellites and to ensure that the power available is sufficient to cover the requirements of all the sub-systems of the satellites for the duration of the mission, using libraries developed by ESTEC. The multi-disciplinary nature of the tool and its versatility allows it to simulate this type of model in which it is necessary to integrate different elements, such as the battery, solar panels, electronics and the calculation of the solar flux as a function of the orbit, attitude and geometry of the satellite, among other factors. PROOSIS has become a widely used tool in the European aerospace industry in recent years. Proof of this is growing interest not only from the companies in the sector, but also from the most prestigious schools, who view PROOSIS as an excellent tool both for the training of future engineers and for use in scientific research. The Institut Supérieur de l’Aéronautique et de l’Espace (ISAE), an internationally recognized school, is focusing on providing a first-class education to its engineering students with a view to their future careers. Last December the school ran an advanced course on PROOSIS, covering the design and simulation of aeronautical motors. The course was given by the team that developed the tool, and was attended by both instructors at the school and Master and Doctorate students.